Beyond the Black Rainbow manages to conjure a very specific aesthetic: It perfectly captures the stark brand of futurism of the late seventies/early eighties, and then delves into a particular hallucinatory dream state found when staying up far too late as a kid watching science-fiction and horror movies on TV. It transforms this into one long languorous dive into some dark places and emerges into some surprisingly light ones. It skirts with becoming an ‘art film’ but its heart sits firmly on a shelf in a long lost video rental store in some dark forgotten strip mall. We are introduced via a promotional video to Arboria, a New Age institute run by Mercurio Arboria (Scott Hylands) but even this seemingly benign video hints at cult-like overtones. In 1983, researcher Barry Nyle (Michael Rogers) seems to take a cold delight in tormenting a young girl, Elena (Eva Allan), who is kept captive in the institute. Elena appears to be a potent psychic kept in check by a strange pyramid device located elsewhere in Arboria. Barry’s home life is a shambles, Mercurio is a drugged up wreck slowly dying in his office, and Barry takes it all out on Elena. But how far can he push her? That plot description is in part my own take on what happens. Beyond the Black Rainbow is not a film that easily gives anything to the audience. Nearly every plot point is open to interpretation. The dialog is minimal, and what does exist is often washed out in the droning synth score. Everything seems to move in slow motion and is occasionally punctuated by moments of violence, horror, and unexpectedly, a few comedic beats. Cosmatos has stated that Phase 4 (1974) was one of his influences and you can certainly feel that in the scoring and pace of this film. The film itself is beautiful, awash in warm hues that directly contradict their existence in such a largely clinical environment. There is a noticeable film grain and thankfully the movie is light on marring itself with fake scratches and artifacts. The special effects all look practically done: cloud tanks, prosthetic make-up, forced perspective shots, etc. and it works to give it an authentic feel. Given the small cast and limited number of sets, it is obviously a low budget film, but it never feels cheap or anything less than superbly crafted. Not much actually happens in the movie, and if you can’t cruise through a film on atmosphere and aesthetic, this may not be the movie for you. There is also an shift in tone in the closing minutes that is perfectly in line with the sort of source material Beyond the Black Rainbow draws upon, but never-the-less is a turn that pulled me out of the movie. Perhaps that was the point though, since the shift in tone follows an abrupt shift in environment. Cosmatos has created something that not only draws from an older aesthetic, but forges it into its own unique identity. If you have some patience and a love of the strange, I’d recommend it heartily. 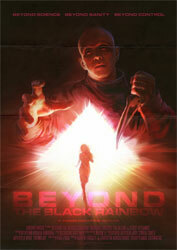 Beyond the Black Rainbow is a film that would be equally home on a Blu-Ray disc or a third generation VHS tape. Where did you find this? I'm interested in seeing it after watching the trailer. Actually managed to catch it in the theater, but I believe it comes out on DVD/Blu-Ray September 11th.